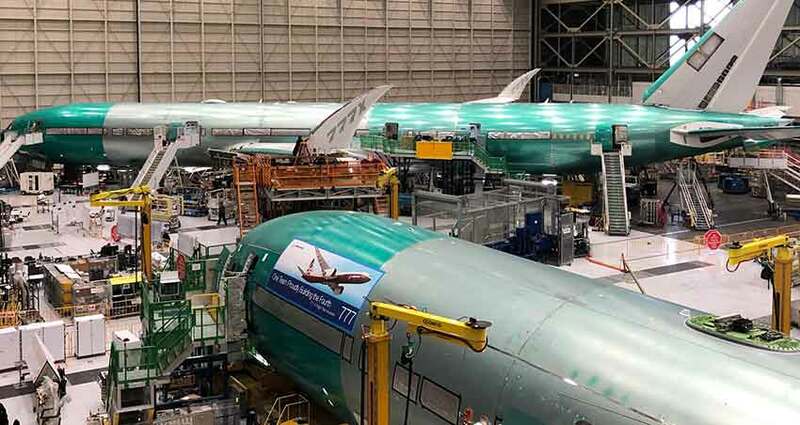 On February 20, 2019, Boeing took to social media to show off the assembly progress of the newest 777X flight test planes. The manufacturer used the occasion to remind that the rollout date announcement is coming “very soon”. The new jetliner has already generated a lot of excitement around the world, as it is the longest passenger airplane Boeing has ever made: the 777-9 spans 77 meters (252 feet) from nose to tail. In January 2019, news emerged that the aircraft has finally been paired with the gigantic GE9X engine, purposely built for the 777X. Roughly the size of a 737’s fuselage, it will be the largest commercial jet engine available. Besides its massive engines and colossal wingspan, the aircraft should be “the largest and most-efficient twin-engine jet in the world,” according to the manufacturer, that also promises airlines a 12% lower fuel consumption and a 10% lower operating costs than “competing airplanes”.